Standing on Sandstone Ranch in the Milk River Ridge natural area in Alberta, there’s a calm that rushes over you, made audible by the wind flowing through the long, native grasses that decorate the landscape. The “whoosh” that fills the air along with the sounds of grassland birds provide a soundtrack as you move across the ranch and take in the natural beauty and diversity of the area. Sandstone Ranch is rich with natural and cultural heritage. Originally purchased by the Nature Conservancy of Canada (NCC) and other partners to protect a large, contiguous tract of intact fescue grasslands, the area holds many natural features, including sandstone outcroppings, hoodoos and fossils. You can’t help but feel special as you stand on one of Canada’s more unique and rare landscapes. This natural area is located in the subregion of the Grassland Natural Region of Alberta, where only 16 per cent of Canada’s native prairie remains. This feeling of wonder is one that Roger Thomson and his family know well. 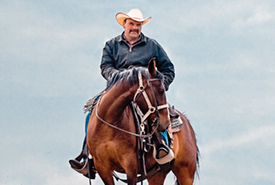 Roger is a fifth-generation rancher who manages the Sandstone Ranch Grazing Co-op, as well as the Ross Lake Community Pasture that neighbours the Sandstone Ranch. On top of that, Roger also owns Rangeview Ranch. Roger and his wife, Lori, both come from ranching families. In 1899, Roger’s great-great-grandfather moved to southern Alberta from Scotland to start ranching. In 1973, the Thomson family moved to what is now called Rangeview Ranch, and Roger and Lori then purchased the land from Roger’s father. The couple went on to raise their two children, Cody and Melissa, on the ranch. Now grown, both children are married with their own children. They live nearby and spend a lot of time visiting and working with Roger and Lori on the ranch. 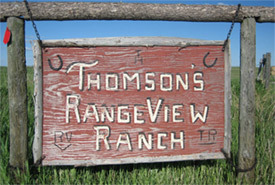 The Thomsons continue to ranch on the land, where they raise cattle and run a working guest ranch. 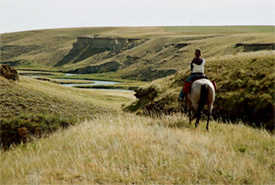 Over the last 28 years that the guest ranch has been open, visitors from all over the world have come to take in the sights and sounds of this uniquely Canadian landscape. Realizing they owned a precious, and rare, habitat, the Thomson family dedicated themselves to protecting the Milk River Ridge for future generations of Canadians and visitors worldwide to enjoy. In 2006, they partnered with NCC to preserve their ranch in its entirety, ensuring the land would remain intact and in its natural state for the long term. “One main principle that we try to keep in the back of our minds is that if you can take care of the natural grass, it will take care of you,” says Roger. “We became involved with NCC just over 13 years ago,” says Roger. “They purchased the land beside our community pasture and held a [Conservation Volunteers] event there to help clean up and remove some of the fencing, and I brought my tractor down to help. A few months later our neighbour sold his land, which was previously owned by my grandpa, to NCC, and they asked us if were interested in renting that land back. What a thrill that was to put our operation back together in what was the original ranch purchased by my family in 1973. Next door to Rangeview Ranch is Sandstone Ranch, a property that is jointly owned by NCC, the Alberta Conservation Association and the Alberta Fish and Game Association. Roger and Leta Pezderic, NCC’s natural area manager, are the lead managers for the deeded portion and work alongside their partners and Alberta Environment and Parks – Public Lands and the Sandstone Ranch Grazing Co-operative to manage the Crown lease lands as a unit with the deeded portion. Roger now manages the livestock operations on all NCC-owned properties on the Milk River Ridge. He is a great example of a steward of the land, demonstrating that ranching and conservation go hand in hand. NCC’s Sandstone Ranch has also participated in the MULTISAR Program: a collaboration between the Government of Alberta, non-government organizations and landowners — such as the Thomson family — to manage habitat for multiple species at risk. As part of this program, a Habitat Conservation Strategy was developed in 2008 to help guide the management of this working ranch for both wildlife and cattle. With the help of families like the Thomsons, NCC has helped conserve rare and vulnerable habitat in this region for the long term.